One of my biggest pet peeve is tardiness. In order to make sure I am almost always on time, I actually set my clock and watch about 5-10 minutes ahead. We don't like for others to waste our time then it is equally important we respect others precious time. In order to help with keeping time in 2011, one lucky Savvy Mode readers will have chance to win one of the 5 watches shown above. Instead of picking one watch to giveaway, I am giving the winner the choice to pick his/her new watch. On the side note, with Valentine's Day just around the corner, I think CEX0P001B and CTD09001B will be perfectly savvy gifts for all the beaus out there. Personally I like the one with leather strap more for the classic sporty look. 2. Tell me how do you stay on time and which watch you like to win. 3. Share this giveaway on FB, Twitter or your blog for extra entries. 4. US readers only this time. 5. From Jan 7, 2011 to Jan 21, 2011. I am a follower! 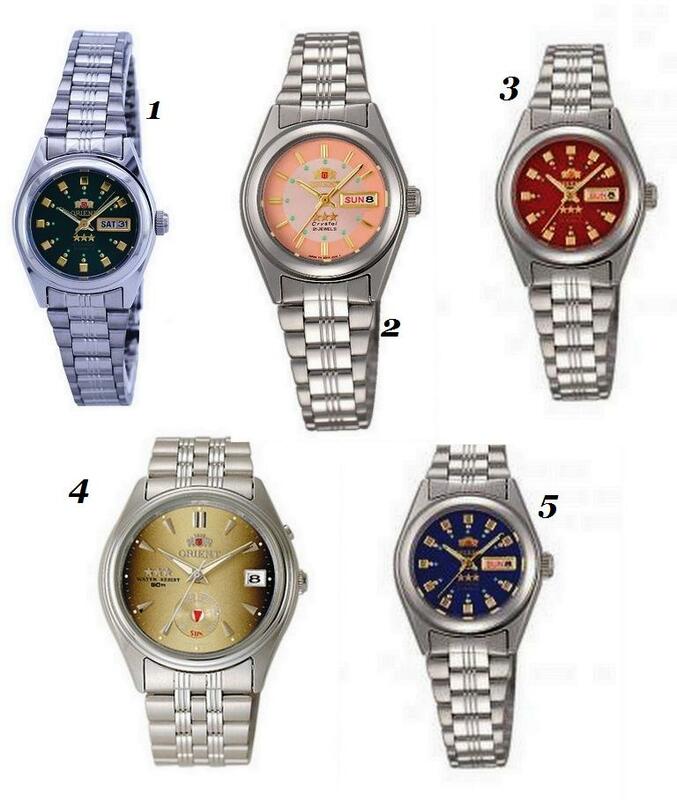 I would like the men's khaki watch (#4) if I am the lucky winner. I stay on time by driving fast. HA! Just kidding. I stay on time by just being disciplined and leaving the house when I need to! I'm a follower. And I use my cellphone to keep on time. I HATE being late so I rely heavily on clocks! Ooh, what a fabulous giveaway! I stay on time by using, what else, a watch! Though I would love to have # 2 - what a gorgeous piece! I love Orient watches ~ I have the pink face one. I'm a follower and would choose watch # 5 if I should win. I stay on time by keeping the clock in my car a few minutes ahead of time. It makes me think its later than it really is so I arrive places on time. I love the watch with the navy face. I am a follower and I love watch #3! I stay on time by waking up too early to ever be late! I am a follower, I love watch #2, and I am always on time unless something crazy happens :) I usually set my house clock 15 min ahead of time, and always pack the night before. Like if I have a meeting in the morning I make sure the outfit is set the night before, all my documents are in a folder ready to go, so all I have to do is walk out the door. No last minute scuttling around my apt! I'm a follower. I stay on time by setting my watch and clocks 10 minutes ahead and packing my lunches the night before so that I can grab them from the fridge in the morning on my way out to work. I love watch # 3. I follow you with Google Friend and subscribe by email. I set my clocks/watch 5-10 minutes ahead too! I'd rather be early than late. The watches are very nice! I like #2. The day/date feature is important too :) Thanks!